For the past few weeks, I’ve been experimenting with lavender vinegar and must say, I love it as much as rose petal vinegar! Gather lavender, rub the buds off into a jar, then cover with vinegar. Immediately cap to keep the vapors in. Store in a dark cabinet for a few weeks, shaking periodically. If you don’t have a non-metallic top, then use a layer of plastic wrap or wax paper between the lid and the vinegar to prevent rusting and a yucky metallic taste. My lavender supply is much more limited than my roses, so I end up filling less than 1/4 of the jar with flowers. I haven’t used fabric softener in years; primarily because it seems to make my husband and son break out in hives when I do, but also because it contains a mash of nasty toxic chemicals that I’d like to avoid.Sure, it smells great, but that’s not worth it to me. Instead, I use 1/4 cup vinegar plus enough water to fill my fabric softener dispenser on my washing machine along with avoiding over-drying the clothes. 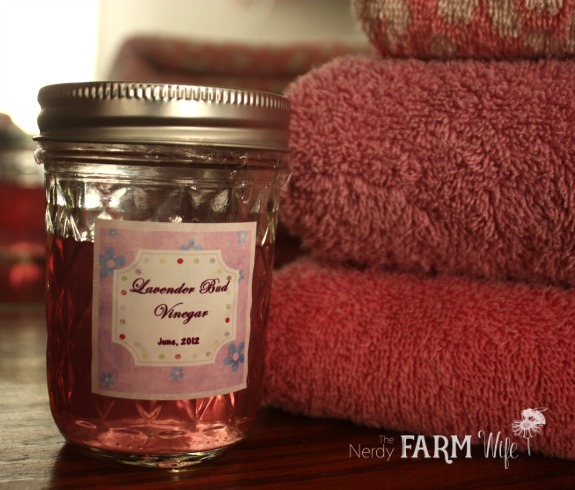 I love using lavender vinegar in my wash because not only does it lend a freshness to the laundry, but lavender is also antibacterial in nature. If the scent is not quite strong enough, you can add a few drops of lavender essential oil (<- affiliate link) to boost it. Did you know lavender is repulsive to fleas and ticks? I’ve been experimenting with this spray over the last week and must say, I love it! Simply mix equal parts of lavender vinegar and water and mix well in a spray bottle. You can use this, as is, or add a few drops of essential oils, known for repelling insects. I added citronella, peppermint and eucalyptus since that’s what I had handy. 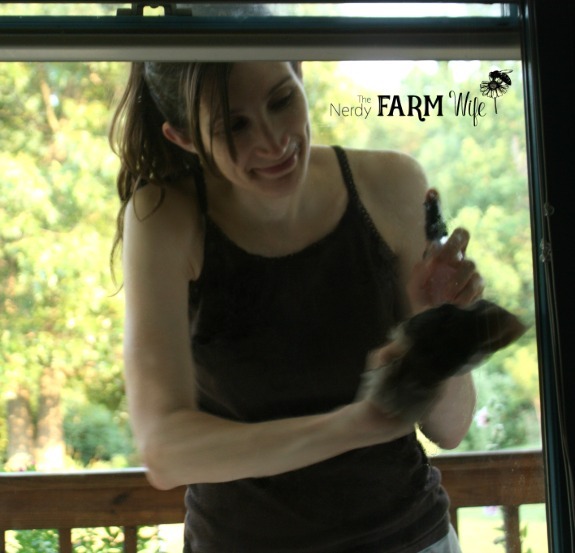 Shake well, then mist your dog and their bedding with this mixture daily, plus whenever you take them outside. We had some fleas hitchhike home on the new puppy after a vet visit. This spray gives her instant relief while I’m working on breaking the flea cycle. I love using vinegar hair rinses! I try to use roughly 1 part vinegar to 1 to 2 parts of water. (Adjust this ratio to suit your hair type.) This helps to remove soap & shampoo buildup from your hair. Another bonus, and this I learned from being a pre-school teacher, is that using vinegar rinses also discourages lice from setting up residence on your scalp. So, I have a confession to make. I rarely wash my windows. I do, however, have to frequently wipe down my glass front door and bathroom mirrors. There’s something about those commercial blue glass cleaners that makes me feel sick; I mean, literally queasy when I smell them. So, I use this mixture instead: 1 part vinegar, 1 part water and a tiny pinch of cornstarch. I realize a bunch of people just went… “Huh?” when they read ‘cornstarch’, but yep, that’s what I meant! I read that tip somewhere in time and I think it does boost the cleaning power of the mixture. It can be omitted though. I also use crumpled newspapers to clean because (a.) I just can’t bring myself to buy paper towels anymore and (b.) because that’s what I learned to use growing up! When my son was little, we pursued a variety of natural treatments for his ailments. One of those was taking Epsom salt & vinegar baths. These were given for detoxification purposes, but also seemed to calm and relax him. Lavender is especially soothing to both the mind and the skin. Just add a few splashes of vinegar and a generous sprinkling of Epsom salts to your bath water while it’s running and relax! 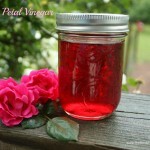 Liniment for Varicose Veins | Rose Petal Vinegar | Violet Vinegar. If you enjoy making things from the flowers and herbs that grow around you, I think you’ll love my book – 101 Easy Homemade Products for Your Skin, Health & Home! Tagged fabric softener, fleas, lavender, pets, vinegar. Bookmark the permalink. Thanks for all of these wonderful ideas! I love my lemon infused vinegar, but never thought to do lavender! Love this! I mixed up a batch and have it in the cupboard as we speak (type)! I love my calendula and lavender infused oils, so I can’t wait to try this. Love this idea! Gonna have to give it a shot! I am just getting into using all natural substitutes for my household. Vinegar is something that I have discovered can be used just about everything. I planted lavender last year and it is starting to bloom. I’ve been taking about what I am going to with it and now I know! I cannot wait to make this! Do I dry my lavender out first? How much should I use if I mix it with a quart of vinegar? I love your blog! Feel free to check mine out too. I think we have lots in common although you seem to be way more knowledgable then me. I’m looking forward to following your blog. Hi there! I use fresh lavender but I’m sure dried would work too. Since I don’t have a lot growing at once, I just use whatever I have gathered that day – sometimes more, sometimes less. I use jelly jars and it seems to work perfectly for the small amount of flowers I put in. There’s really no wrong way to make it – just throw some flowers in and see how you like the result then adjust as you go. You can always add more! You can indeed use dried Lavender! Although it doesn’t smell as strong as fresh. Its still just as good. Thank you for sharing this great ideas! I heard that some Essential Oils are poisonous to cats and dogs. 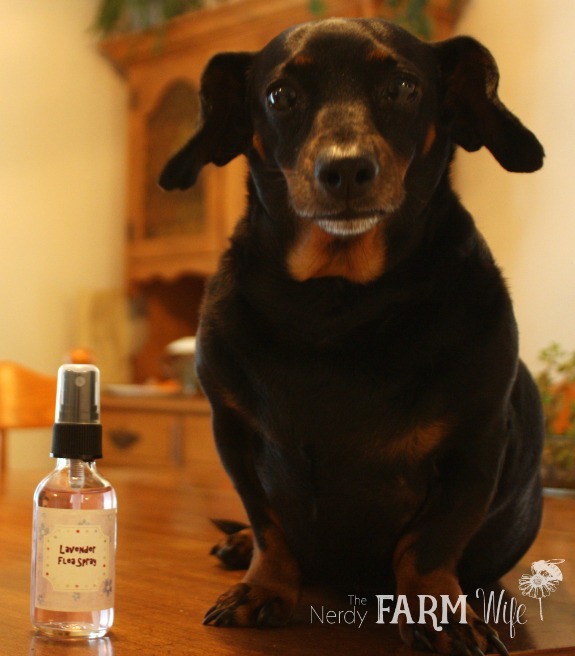 I personally would recommend not spraying the Lavender Vinegar ON your pets :) Just a little warning – would hate for someones pet to get sick. I’m going to my Mama’s tomorrow and I’m stealing some of her lavender plants, so the timing of this post was perfect! I love getting plants from my mom’s too! :) Hope you enjoy all that lavender! Hi Jenn, The scent of lavender is quite strong after a few weeks, but you can still detect a hint of vinegar in there. If he’s that allergic, I think I’d avoid it for him. I know I would for my hubby! :) I love tea tree oil too – once my kids were directly exposed, for several hours, to someone who turned up having lice the next day. We have a wonderful health store nearby ran by a naturopath and she gave me tea tree oil to massage in their scalp. Thankfully, they didn’t end up with lice and I feel the tea tree did the job! Thanks! I may try it when he is not home..its not an allergy that is systemic or that would bother him after the fact! 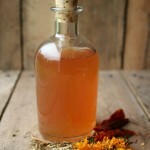 I have used vinegar as a hair rinse since age 9 and a face toner, flea bath for the cat, tea with honey, cleaning etc. never without it. Thanks for your post! Thanks for the comment! :) I’ve only recently been discovering just how wonderful vinegar is and am really enjoying finding out all of the great ways it can be used. I love the idea of using it as a face toner! Fantastic ideas. Lavender is a favourite! I love it. I have just started infusing , making lotion it is amazing. My Hubby had a rash and he was let’s say on the fence. Two days applying lavender lotion he us a believer! Thank you my vinegar is infusing as we speak. Happy fourth of July Everyone! A bit late, but happy 4th to you too! :) Lavender lotion sounds wonderful! Found your post through Frugally Sustainable. I’m wondering if anyone has an opinion on vinegar. I use Bragg’s Apple Cider Vinegar for my hair rinse and find it so much better than Heinz. Wondering if Heinz or the store brand is ok when using for an infusion or if there is something better. Thank you, so much for this!! I am off to make some Lavender vinegar up; as I have plenty of lavender in my garden!! I can’t wait to use it! I might put some in pretty jars for Christmas presents! I think you will love it! :) One side note – I made some last week and since our power was out and I couldn’t heat the vinegar first, decided to set it in the sunlight, outdoors where the temps were hovering around 100. It turned from the pretty pinkish color to a plain light brown. Not so pretty! So definitely keep this one from the sunlight also! I came over from Crunchy Betty’s FB link and I’m glad I did! I use vinegar in my Montessori classroom for the children to wash the windows, and now we can make the infused vinegar for it, too! Among the other uses, of course :) Thanks! do you have to use a fresh flower or is there something in a powder maybe you can use? Thanks for sharing your tips on using lavender vinegar. 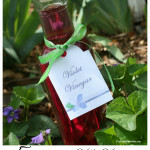 It’s one vinegar I’ve yet to make and I like the idea of it being used in the laundry…will have to make some next year! Great ideas! Thanks for linking this post up this week at the Clever Chicks Blog Hop! I’m going to try the window cleaner and fabric softener uses for sure! I’m sorry to admit I don’t know how I found your blog, but very happy I did. I just happen to have 8 cruet bottles with clip on stoppers left over from another project & a bunch of lavender from another–put together guess what my neighbors are getting in their Christmas baskets? I Love your site. I have tried, lemon,orange and rose petals. I love the results that I get in my home. Fresh …fresh no chemical smells. Keep the great posts coming. Cannot wait to plant Lavendar in the spring. I will be searching for fresh or dried L from now on. Gave a bottle of Roce petal vinegar in a recycle Maple syrup bottle she just love the gift. Can lavender oils be used instead of the flower plant ,in vinegar . Hi Elaine! :) Yes, you can use a few drops of pure lavender essential oil instead. Loved the pet idea cause I have 3 dogs ;) gonna try it! Thanks again! I made a batch of this to replace regular white vinegar that I normally use as fabric softener. I love the color! One question: does it tint your clothing pink? Thank you! Hi Micheline! I was afraid that would happen at first too! But, it’s diluted with water and doesn’t leave a bit of tint. I have tested undiluted rose petal vinegar, made with my reddest roses and directly spritzed on a white t-shirt and it left a pinkish splotch. (That washed out though.) So, I don’t suggest dark red rose petal vinegar undiluted for laundry, but the lavender has always worked great for me. It worked brilliantly! I love it so much I linked back to your blog in a post on DIY lavender sachets at http://ragandremnant.blogspot.com/2013/07/lavender-sachet-tutorial.html. I’m going to make another batch. Thank you!!! Do you use white vinegar for this?? Hi Sarah, I use white vinegar since I use it mostly for cleaning/household (plus it lets the pretty color shine through best!) :) You can also use apple cider vinegar if you’d like. It’s also wonderful as a sunburn spray. It takes the burn out immediately and the lavender helps to further soothe the skin. Thanx so much for the ideas, which I am going to try. Do you use spirit vinegar or wine vinegar? Sorry if I missed it…but can it be used in a front loading washer as fabric softener? I just found this site and I am soo going to try some of these recipes. I LOVE all the homemade cool and neat stuff you can do, made from vinegar! THANK YOU!! Hello, I am brewing some Lavender Vinegar as I type, planning to use it on salads etc. I have noticed that quite a bit of the vinegar has been absorbed by the lavender buds…suggestions? Thank you for sharing your recipe and advise. Hi Claudia, You can top the jar off with more vinegar as needed; you want to keep the buds covered with liquid. How wonderful to have a 2 acre lavender farm – it sounds lovely! I have been brewing my own vinegar from a mother for about a year now. I have been growing roses and lavender too. 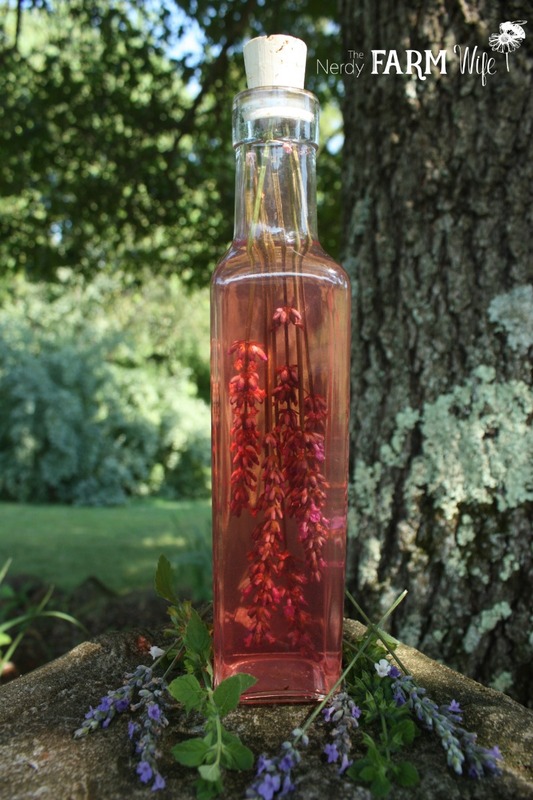 I have been thinking about brewing rose and or lavender vinegar. You can turn just about anything into vinegar, and fermenting your own vinegar is way better than infusing. I make lemon vinegar to clean my whole house too! I have just found your blog, and plan to read more, but if you have not tried even lemon infused vinegar you should! It is amazing! Hi Amanda, That is a really interesting idea about making vinegar from roses and lavender. I’ll have to research that and learn more – thanks for sharing the tip! I’ve been looking for a recipe for lavender vinegar. Anyone who suffers from prickley heat (heat rash) knows how uncomfortable it gets. Itches and hurts if you scratch… it’s often in places you can’t scratch anyway. I’ve recently discovered that vinegar dabbed on is the fastest, most effective relief I’ve ever tried. I’m using apple cider vinegar at the minute but thought lavender vinegar would smell so much nicer. Hi Freda, I’m glad you found something to help! I think you’ll really like lavender vinegar too! What a gorgeous color! I love the hair rinse photo…. to die for! I’m doing the no poo method as a challenge this month and I look forward to sprucing up the vinegar rinse. Thanks for the great idea! Thank you Tash! Good luck with your no poo challenge! Hi there, I have just moved in to a place with dozens of large mature lavender plants and I am going to harvest flowers this weekend. I love the idea of lavender and vinegar for windows! I am going to use it on my carpets to discourage carpet moths too. (we have a problem with them in the south of England!) Vinegar is quite strong smelling – what kind of vinegar do you use and does the lavender neutralise the sour, acidic smell of the vinegar? Hi Loren! I use common white vinegar for household use. If you let your lavender infuse long enough, it will really mellow the sharp vinegar scent. I’m not a fan of the smell of straight vinegar either, but do like the lavender vinegar. Enjoy those wonderful lavender plants! Hi Patricia, Yes, you can use the leaves too! I tend to use them more like rosemary. They’re really nice blended with other green herbs in bath soaks too. I have grown lavender for many year, mainly for the bees and butterflies, and its wonderful perfume. My Grandmother used to give me her empty Yardley’s bottles and the smell linger for ages. I have made pillows and bags for the linen cupboard and draws. Now I have discovered through your web site how to make lavender vinegar. 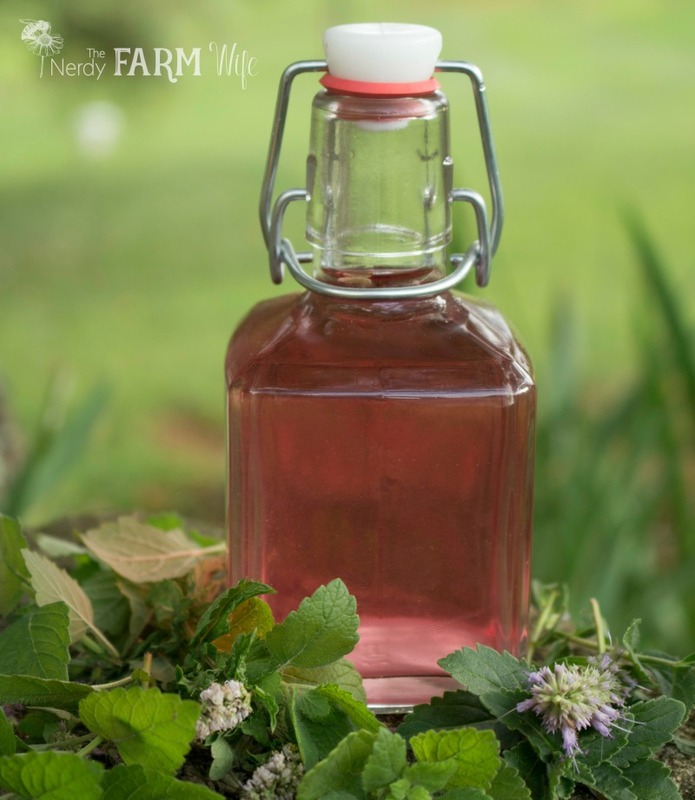 I love and use cider vinegar with honey, and look forward to experimenting with others. To make lavender is it right that I should use white or white wine vinegar? Hi Joan, What a wonderful memory of your grandmother! It sounds like you have all sorts of lovely ideas for lavender. For the lavender infused vinegar, I like to use regular white vinegar, for household use, or white wine vinegar, if I plan on using it for culinary purposes. I only use those though, because they’re clear and show up the pretty lavender-pink color best. If you enjoy using apple cider vinegar, you can definitely use that instead. I love the beautiful color of this vinegar! I have been trying to establish the lavender section of my herb garden for 2 yrs now. This year I’ve had a total of 6 ? lavender stalks from my one surviving plant from last year. I couldn’t wait to start using the wonderful scent though and since I have quite vigorous foliage growth I used that to make a lavender & lemon balm vinegar. I was aiming for the beginnings of an insect repellent, but the scent combo was just too good & I mixed it with oil for a salad dressing! 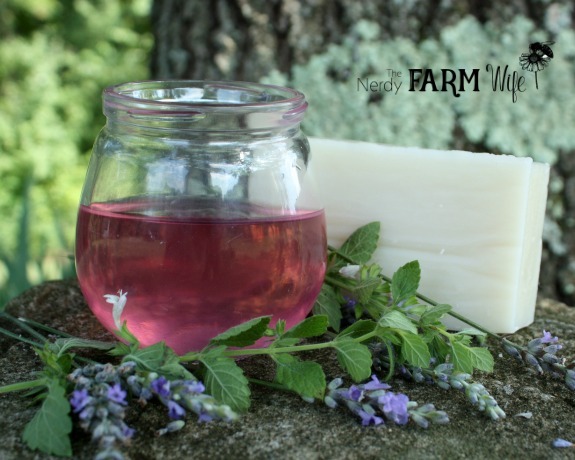 I know you grow lemon balm, so I would definitely recommend you try it sometime. I used quite a bit more lemon balm than lavender; not sure of exact ratios though. You don’t get the gorgeous color but the flavor/smell makes up for it! Thanks for all the great info. Great tips Terri – thank you for sharing! I have indoor dogs too and I will definitely have to try that out!